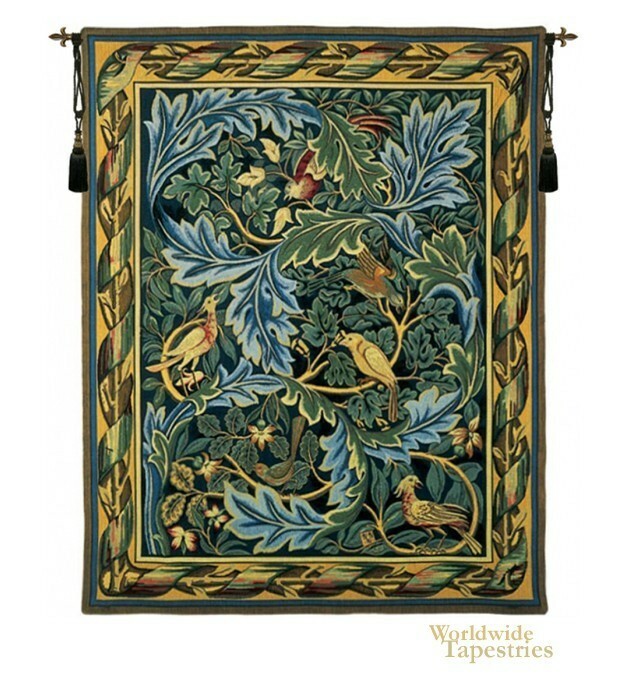 This piece 'Les Oiseaux' is vintage piece based on the design of William Morris, the great pre-Raphaelite artist from Waltham, England. In this delightful work, we are greeted with 5 charming birds on a tree laden with ancanthus like leaves. This very motif of the acanthus leaves is a favorite of Morris, for it's ability to create just the right effect of stillness and movement, with a pattern like effect to tie a piece together. In this case, we see the birds, including some baby pheasants perching and enjoying the delights this tree has to offer. The theme of the work is the celebration of nature, not only with subject matter but also with the choice of colors which include blues and greens for the foliage and yellows, browns and reds for the fauna as well as the nature inspired border which completes the work. This tapestry is lined and has a tunnel for easy hanging. Note: tapestry rod and tassels, where pictured, are purchased separately.